Pushkar is a holy city in Rajasthan, India famous for its Brahma temple, lake, ghats, and bazaar. 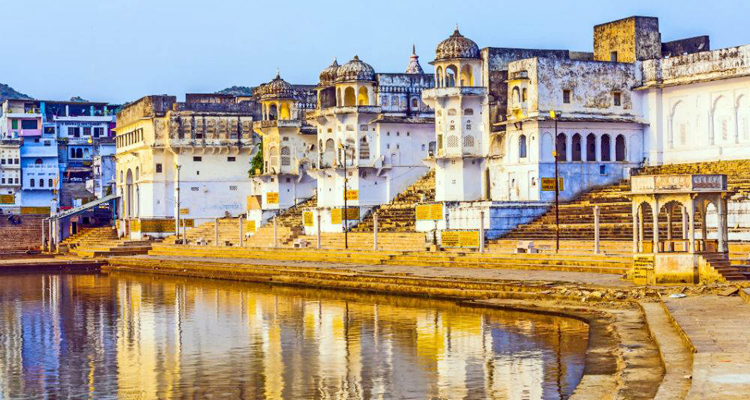 Pushkar is a holy town in the state of Rajasthan famous for the Pushkar lake, various ghats and temples spread all around the lake. The word ‘Pushkar’ means lotus flower, which is said to be the seat of Brahma, one of the Hindu holy trinity, who is worshipped as the creator of this world. The legend has it that the demon Vajra Nabha killed Brahma’s children, he in turn struck him with his weapon, a lotus flower. Vajra Nabha died with the impact, and the petals of the lotus fell at three places. One of them is Pushkar, where it gave birth to a lake. Brahma is supposed to have performed sacrifice at this lake on Kartik Purnima (the full moon day of the Kartik month (generally in the month of November)), hallowing the place. Though Brahma is considered to be the creator of the world, Pushkar is the only temple of this important deity in the whole world. This is also considered as Adi Teerth or Teertharaj meaning ancient holy place or the most important of holy places respectively. There are not many temples built for Brahma because his influence to the daily life is considered not a big as Vishnu (Preserver), Shiva (Destroyer) and Ganesh (Remover of Obstacles). Being the creator, whatever being created is already there, whereas other deities’ need to be appeased so that any wishes or favours can be granted or fulfilled. Rainfall: Rainy Season from July to Mid Sept, and very humid (upto 90%). Pushkar Camel Fair: Pushkar is world famous for its cattle fair normally held in the Hindu month Kartika, which is around Oct-November. At this time the town jam-packed with tribal people from all over Rajasthan and tourist. It is commonly known as Camel fair, bringing with them several camels and cattle to the pilgrimage. A Fair ground is fashioned and is packed with shops selling souvenirs and eateries. And villagers come sell camels, horses, elephants and cattle and other livestock. Elaborate arrangement for staying of visitors is made including luxury tents. Just don’t miss the Pushkar Fair if you are in India around that time. Pushkar Lake: The pious Pushkar Lake is believed to having been created by the falling of lotus from the hand of Lord Brahma. It is considered to be as old as the creation. The lake is considered as one of the most sacred spots, and believed that one dip in the waters of lake on Kartika Poornima ocassion is equivalent to performing yagnas for several hundred years. Old Rangji Temple: Lord Rangji is an carnation in of lord Vishnu. This temple was built in 1823 by Seth Puran Mal Ganeriwal of Hyderabad.This temple is unique due to confluence of South Indian style (Dravid) Rajput and Mughal style of architecture. New Temple: The gracious temple is very conspicuous, due to its south Indian style of architecture. It has a high rising Gopuram typical of southern India Pushkar has more than 400 temples, the other important temples are Balaji la Mandir and Man Mandir. Savitri Temple: The temple of Lord Brahma’s first wife. It is located on the hill behind the Brahma temple and one has to climb a long series of steps to reach the shrine. It commands a panoramic view of the beautiful lake and the picturesque surrounding of the villages. Saraswati Temple: Saraswati is the wife of Brahma. Literally her name means ‘the flowing one’ .In the Rig Veda she represents a river deity and is connected with fertility and purification. She is considered the personification of all knowledge – arts, sciences, crafts and skills. She is the goddess of the creative impulse, the source of music, beauty and eloquence. By Air: The nearest airport is Jaipur (145 km), from where one can take flights for Delhi and Mumbai. By Rail: Ajmer is the nearest railway station from where one can take trains for the major destinations in Rajasthan and other parts of India. By Road: Pushkar is connected to Ajmer by road. Buses, jeeps and taxis are also available. Plan your Trip with us and get best offers on all types of travelling across India. India Driver Tours is a popular name in Travel Industry for providing Indian Holiday Packages, tailor-made India tours and travel services at affordable prices. © 2018 India Driver Tours, New Delhi. All Rights Reserved.